Q: We definitely need to do someÂ­thing with our living room and dining room. The living room furniture all needs to be replaced with the exception of two square end tables and lamps, a floor temp and possibly an oval coffee table. We want to keep all of the dining room furniture, as it is relatively new and we like it. My problem is this: We have a large family and often need to seat up to 19 people for dinner. When we extend the table in the dining room, it's virtually wall-to-wall. No one can walk around it and all the food has to be passed across it. The setup is not at all adequate or functional. We checked into opening up the entrance into the dining room from the living room to make it wider. We thought it would greatly ease the problem and be relatively easy to do. We discovered, from speaking with a contractor, that the walls are filled with heating ducts and pipes going to, the second floor. Thus, we nixed that idea and now don't know what to do. I am aware that some people set up two tables to serve this number of people, but we donâ€™t care to do that Also, we have eight to 10 people so often that we'd like a more permanent, and easier, solution. If you have any solutions for this area, we'd be very appreciative. A: I really don't think your problem is that unusual I question how many large living rooms remain virtually untouched white other areas of the home are left to serve all the family's, needs. I would bet a tot. 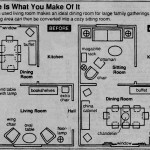 Just-because everyone perceives a space as a living room or dining room doesn't at all mean it has to remain that. 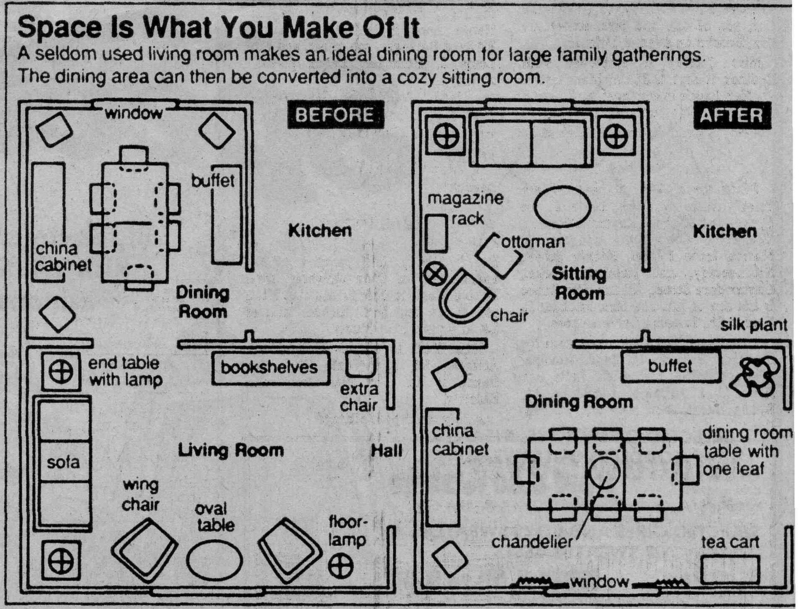 Why canâ€™t the living room become the dining room and vice versa? You need the larger space to accommodate serving meals and you donâ€™t use the living room when you entertain a lot of people. It only makes sense to switch them. The dining room table with both leaves would easily fit into the 19-foot living room as you've sketched it Center it in front of the window with a chandelier hanging over the middle. I would leave one leaf in the table at all times with eight chairs around it. The extra leaf can easily be added when needed and the two other chairs can be pulled up from either side of the china cabinet on the end wall. The buffet would work well on the wall adjacent to the kitchen and is very accessible for serving. A silk plant to the right softens the corner and utilizes the dead space. A tea cart would fit nicely between the window and the hall wall. It would also be very useful when entertaining a large number of people. If you choose draperies, for your window treatment, be certain that they extend beyond the casing to expose all the light when opened. This is especialÂ­ly important in this room, because it's the only window and you want to maximize it. The previous dining room now becomes a cozy sitting room for you and your husband. A 78-inch sofa fits well along the window wall with the two existing, tables and lamps to either side. Placing this grouping from wall to wall also makes the room appear wider. I would angle a chair and small ottoman facing the sofa to create a conversational grouping, as well as provide a comfortable spot for reading. Next to it, I would place the existing floor lamp and a magazine rack.